Ridges and Rivers is an aerial reflection of the mountain ridges, gorge and water surrounding the Symmes Library. Batik on silk panels portray a 5’ x 12’ view of Table Rock in the Appalachian Mountains, stylized similar to a Japanese woodblock print. The architectural triangular lines are repeated by the 3’ x 16’ drapes of the local rivers; the Reedy River flowing through the center of the city of Greenville and the Saluda River forming the county border. 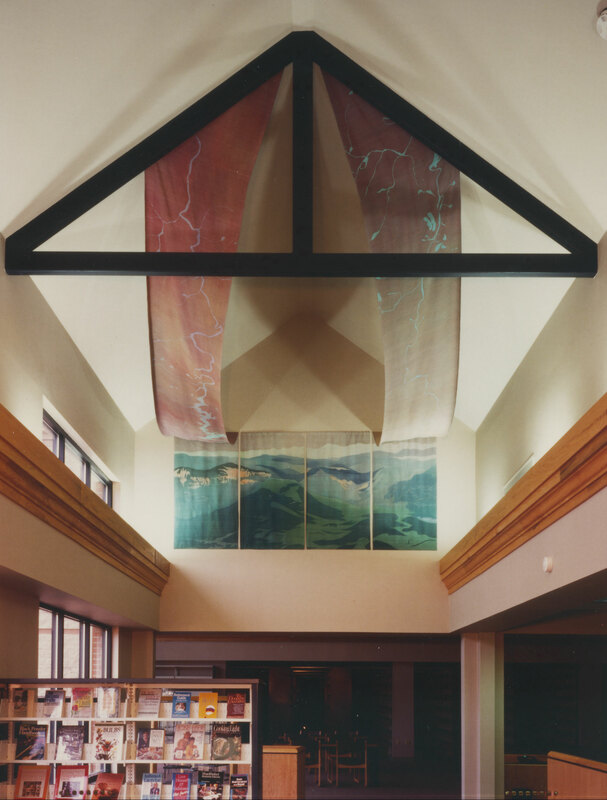 As a site-specific installation, the silks offer a restful sense of place, connecting the exterior environment with the interior library space.